Over-the-counter medicine was a complete guessing game in the 1800s and early 1900s. Quack doctors and anyone with the ability to mix up a batch of goo could claim to have a miracle cure. There were no regulations, and phony doctors could say their recipe cured anything. Most medicines were made from useless ingredients like mineral oil, high doses of opium or heroin, and lies. Others were made from lead, water, and lies. Traveling medicine shows attracted huge crowds, and the smooth-talking medicine men tricked them all. Each one promised that their medicine cured a variety of illnesses. Most of these remedies did nothing. Clark Stanley claimed to sell authentic snake oil which Chinese laborers had brought with them to the United States. The oil contained inflammation-reducing Omega-3 acids because Chinese water snakes ate fish. 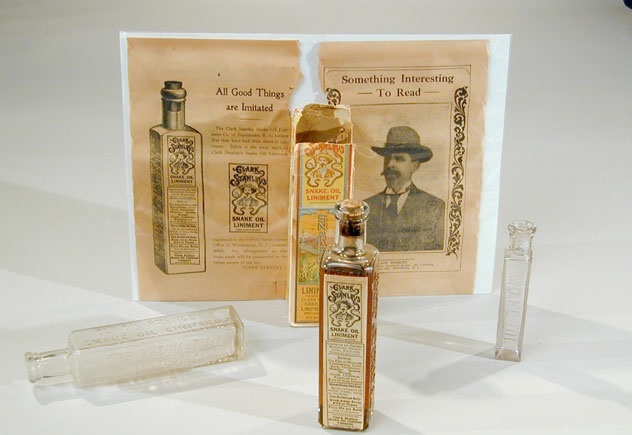 Stanley used the reputation of the real snake oil to sell his version that was supposedly made from rattlesnake oil. It may as well have been water, because it never actually cured anything. Stanley made a name for himself by claiming to be involved with Hopi medicine men. His medicine show routine was a major attraction. He was known as the Rattlesnake King. Stanley pulled a snake out of a basket, cut it open, and boiled it in front of a fascinated crowd. He used the boiled fat from the snake to bottle and sell. In reality, his formula didn’t even contain rattlesnake oil. Still, eager customers snatched up bottles and attempted to soothe their aches with the phony oil. The Pure Food and Drug Act of 1906 required truthfulness in advertising of medications and put a dent in many con men’s medicine empires. In 1917, the FDA seized some of Clark Stanley’s snake oil. They tested it and found that the mixture was mineral oil, beef fat, red pepper, and turpentine. Turpentine was used medicinally in the 19th century. It was later linked to eye, lung, and nervous system damage. Mr. Stanley didn’t even try to deny he was a liar. He paid a cool $20 fine for violating the law. When radiation was discovered in the late 19th century, inventors created all types of radioactive products. By the 20th century, companies sold radium water as a health-enhancing drink. The water was marketed as a cure for over 150 common diseases. You read that right. Companies encouraged people to drink radiated water. Just like today’s advertising, product makers created a problem and then sold a solution. They insisted that water was “denatured” and that it was missing an important ingredient. They marketed radiation as that ingredient. There were prepared drinks like Radithor, but the Revigator was a popular home version. The Revigator was a water dispenser made of ceramic lined with uranium ore. Owners had to fill the container and let their water sit in the radium-lined jug overnight. The idea behind the radiation craze was the belief that natural spring water contained radon. Researchers have since measured the amount of radiation and other chemicals in Revigator-treated water. Dr. Michael Epstein found that other toxic chemicals—like lead and arsenic—were released into water treated with the machine. The Revigator released almost twice as much radiation as the maximum amount recommended by the EPA. The Radium Ore Revigator Company sold thousands of Revigators in the 1920s and ’30s. Of course, they recommended drinking six to eight glasses daily and customers followed instructions. Then we found out that radiation was bad. Really bad. Sold between 1881 and 1906, Kickapoo’s Indian Sagwa was supposedly based on an old Native American remedy used by the Kickapoo tribe. 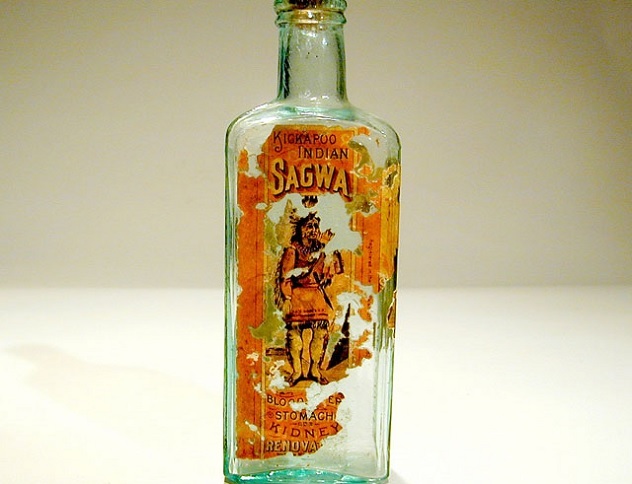 The Indian Sagwa was one of the many medicines marketed as having some connection to ancient Native American medicine. John Healy and Charles Bigelow knew that the public would assume that anything associated with Native American medicine men had to work. Everything sounded wise to a gullible crowd. Healy and Bigelow designed their medicine show to take advantage of the customers’ limited knowledge. The Healy and Bigelow show was one of the more well-known traveling medicine shows. John Healy and Charles Bigelow hired Native Americans to travel with them. The natives in the show wore traditional dress and gave testimony to the audience in their native tribal language. After the Natives Americans gave their testimony, the white men in the troupe would translate. The show included dances, fire-eating, juggling, powwows, and other demonstrations. The host would tell stories and even cure someone on the spot. Of course, that person worked for the show. Outside of the show, the pair printed leaflets to praise their useless medicine. The team stayed consistent with the branding and built an entire business of Kickapoo products such as Kickapoo Indian Salve and Kickapoo Cough Cure. Dr. John Brinkley was known for his goat gland cure, but he also injected colored vitality water into patients after surgery. He promised more virility to men if they got his oddball treatments. A marketer at heart, Brinkley took advantage of radio’s popularity to start his own station in Kansas. He used his radio show to push ads for his strange remedies. Brinkley called his color water “Formula 1020.” He sold it as an aftertreatment for his goat gland patients and a cheaper alternative to surgery. For gullible men who had already paid $750 a pop to get goat glands implanted, the formula was an easy sell. 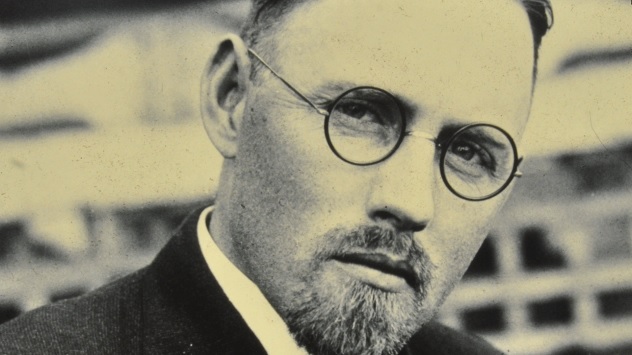 In 1923, a scandal revealed that he wasn’t a doctor and had no surgical training. He had gone to medical school to learn about natural remedies. Too impatient to finish, he bought his degree instead. He was finally stripped of his medical and radio licenses in 1930. After that, he lost the race for Kansas governor. Brinkley opened another clinic and continued injecting naive patients with dyed water. Brinkley was actually declared a quack by a judge in 1939 after he revealed the magic ingredients in Formula 1020. Dr. Morris Fishbein, an editor for the American Medical Association, had outed Formula 1020 as useless color water. Brinkley tried to sue Dr. Fishbein, so he must have forgotten that he actually was a fraud. Brinkley lost the case. Just two years later, he and his wife were indicted for mail fraud. He lost most of the estimated $12 million he had scammed. A few lawsuits later, Brinkley died bankrupt. Doc Meriwether and the Yellow Kid fooled the masses by selling them a miracle drink that supposedly cured tapeworms. Making wild claims about useless medicines was normal for the time, but Doc Meriwether had a special talent for lying. Meriwether swore that the miracle elixir was a secret blend of powerful medicines. During his medicine shows, he talked about the intense research he had done to create the formula. He went on about the lack of real health and vigor of the men in the audience. His miracle elixir ingredients would fix them right up. The ingredients were mainly rainwater, alcohol, epsom salts, and cascara (a plant that has a laxative effect). Doc Meriwether set up a plant in his Chicago home, and his wife mixed and bottled the elixir that he sold for $1 a bottle. According to the good Doc, his miracle elixir was the most effective cure for tapeworms. Americans were experiencing tapeworm fever at the time, and people were easily convinced that the little invaders had taken over their bodies. Doc Meriwether used dancers, singing, and callers to attract a crowd for his shows. Joseph “Yellow Kid” Weil acted like the satisfied customer. He would give testimonials about his experience with the elixir and made big show out of buying several bottles. Joseph told the story of how the miracle cure had saved his young children’s lives. According to Joseph, this was a magic potion he—and others—simply couldn’t live without. The useless elixir sold out easily. Impure or bad blood was the vague cause of many illnesses according to medical quacks. Con men selling fake medicine created conditions that people could suffer from. Canadian politician George Fulford created the G.T. Fulford company and set up a division known as the Dr. Williams Medicine Company. He had purchased the patent for Pink Pills from an actual Dr. Williams. Using the name, Fulford sold his pills as a cure for bad blood, weak appetites, depression, heart palpitations, and low energy. The pamphlets for these pills claimed that all diseases resulted from an imbalance of the four humors. The theory stated that if the body’s blood, phlegm, yellow bile, and black bile were out of whack, illness would strike. The suspected excess of any of the four substances led to practices to remove the extra fluid. Bloodletting was used to drain the body of extra blood. This wacky theory has since been discredited by the medical community. Fulford eventually shortened the name of his product to Dr. Williams’ Pink Pills (it’s not just for pale people anymore) and marketed them in more than 80 countries. He focused on testimonials as his advertising tool. His instruction pamphlets gave detailed information on best uses and benefits. They also ordered the patient to take one pill after each meal and to stop eating soup, porridge, and pickles. The logic was that those foods made the blood watery and needed to be avoided while the pills built the blood back up. Good Dr. Williams also advised the use of a laxative before popping pink pills and a bath complete with mustard for women taking the pills. The marketing campaign was fantastic, but the only thing in these pills was sugar and iron. Colonel George Gil Green was the man behind Dr. Boschee’s German Syrup. He had started medical school but like many quacks before him, he dropped out. After returning from fighting in the Civil War, Green bought the rights to his father’s syrup, which contained laudanum and alcohol and was purported to help “cure” a range of diseases. It definitely made people feel good for a while. Laudanum is a combination of opium, morphine, codeine, and other addictive substances. Laudanum was sold on its own without a prescription in the late 1800s, and people used it as a cough suppressant and painkiller. George Gil Green marketed the addictive syrup as a throat and lung cure-all. He claimed that users wouldn’t suffer from coughs, colds, or consumption anymore. The marketing even invoked scenes of people on their deathbed being saved by the magic syrup. Many testimonials were given by actual pharmacists. 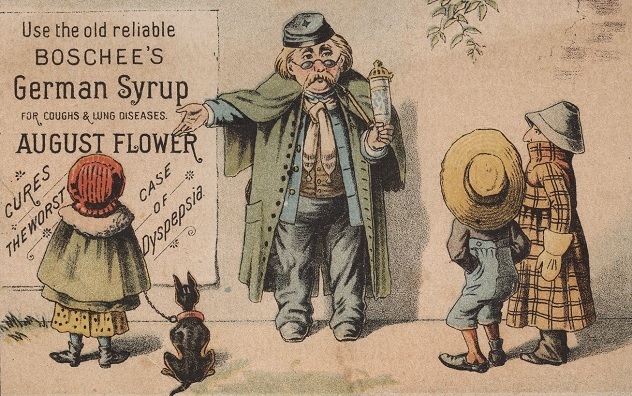 In one advertisement, a druggist claimed that even with his knowledge of many medicines, Dr. Boschee’s German Syrup was the best for throat problems. Green’s marketing campaign also included giving away sample bottles for 10 cents. What a steal! To further the drama, Green claimed the medicine was actually created in Germany. These kind of marketing tactics kept the syrup flying off shelves. 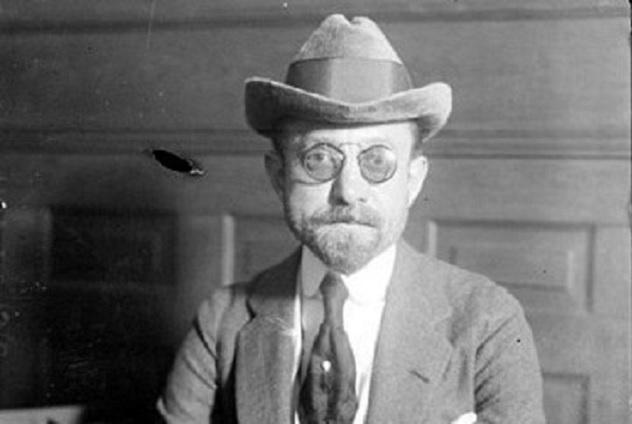 He sold so much German syrup that he became a millionaire and bought a hotel in Pasadena, California, an opera house, and several other buildings in Woodbury, New Jersey. Like other medicine makers of the time though, the new regulations in 1906 exposed his scam and dramatically cut his sales. Female complaints were considered a common problem in the 19th century. The symptoms were rarely talked about in specific terms though, and most patent medicine makers just hinted at the issues they believed women had. They marketed plenty of medicines to women and their delicate systems—one of the popular was Dr. F.G. Johnson’s French Female Pills. 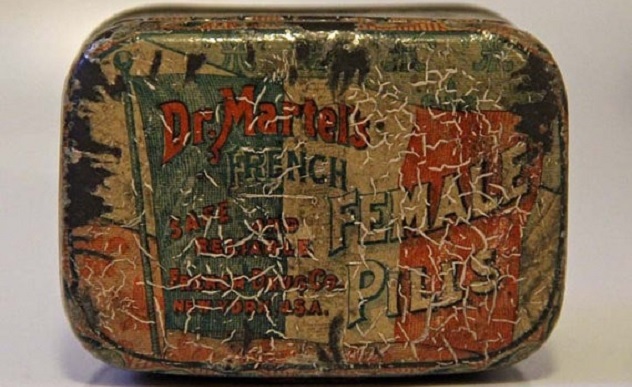 These French Female Pills mostly contained supplements that we use today, like iron and calcium. Both minerals are linked to strong bones and healthy immune systems. If the makers had stopped with those ingredients, these pills would have been harmless. Unfortunately, they added mercury and lead. In the 19th century, doctors used mercury to kill syphilis so it at least had one legitimate medical use. The treatment worked for syphilis, but later research found that too much mercury can cause neurological damage. Exposure to mercury is especially dangerous to babies during pregnancy. Lead is equally dangerous, especially to children. Lead gave medicines a sweet flavor, so many patent medicine makers added it for taste. The addition of these ingredients made Dr. F.G. Johnson’s French Female Pills a risky bet for women. Hamlin’s Wizard Oil was created in 1861 by a magician named John Austen Hamlin and his brother Lysander. With a magician’s background, Hamlin knew exactly how to make profits appear. The Hamlins claimed that their Wizard Oil would clear up sore throats, headaches, and bruises. They promoted it as a cure for diphtheria, rheumatism, and even cancer. Most of the advertising focused on pushing it as family medicine for everyone. 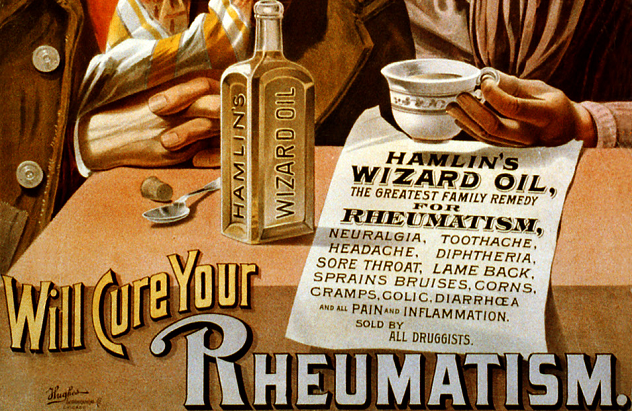 They also claimed that it was the most effective cure for rheumatism. The Hamlins promised that there “was no sore it will not heal and no pain it will not subdue.” With ingredients like ammonia and chloroform though, Hamlin’s Wizard Oil did more harm than good. The oil had multiple advertisements that appeared in farmers’ almanacs and newspapers. These colorful ads made the oil even more popular and well known. There were even claims that Hamlin’s oil could cure animals. Almanacs featured an ad with an elephant gulping the oil to cure itself. These wizards used the magic of lying to score big profits until the government crackdown in 1906. Asthma is a serious condition that affects the quality of life of millions of people. Asthma treatments throughout history—such as vomiting and drinking the blood of wild horses—were sketchy and ineffective at best and completely insane at worst. Modern asthma treatments use inhaled corticosteroids, which reduce inflammation. This is standard today, but the 19th-century understanding of asthma was both unhelpful and dangerous. Physicians and fake medicine men suggested treating asthma by inhaling fumes or smoke. There were cigarettes made for asthmatics, and kids were encouraged to smoke for asthma relief. 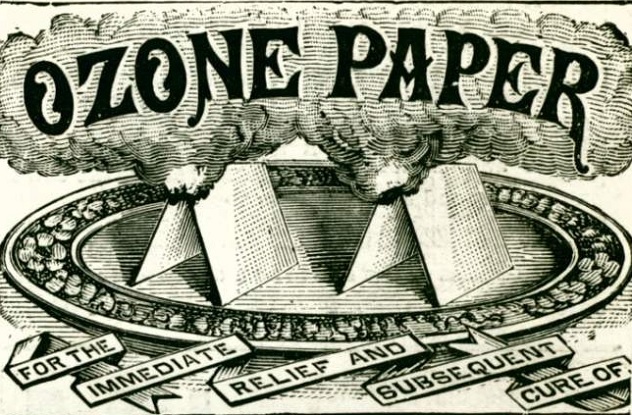 Ozone Paper was a “special paper” that the asthma sufferer would light and then inhale the fumes. Its makers pushed it as a cure for bronchitis as well. The marketing leaflets used testimonies from supposed patients and doctors. They implied the paper didn’t just manage attacks—it cured asthma completely. It was an attractive solution to people who had severe asthma attacks. Of course, it was all smoke and mirrors. Doctors originally thought that asthma was the result of phlegm in the lungs, and they recommended smoke therapy to dry out the fluid inside. Eventually, the medical community attributed asthma to allergic inflammation and realized that smoke and fumes made breathing more difficult. With the increased use of nebulizers and portable inhalers (along with mounting evidence that smoking causes a ton of harm), support for smoking to cure asthma quickly went out of style. Kacey is a freelance writer who appreciates a good mind bender. She is an avid traveler and film buff. In her downtime she writes poetry, watches House Hunters, and dances like no one is watching. Kacey blogs about less illegal ventures (most of the time) at The Dreamer’s Loft.